These were such a quick knit and such fun to design that I decided to knit a pair for Jenny who is also going to the game. She is a Minnesota alumni, so I had to design with a different “M” in mind. Since this pattern is such a great blank slate to make your own team mittens, I thought I would share all the tools needed to make your own. First, you need to design the chart for your mittens. You can download a Blank Chart here. Now with a pencil and eraser, fill in squares to create your pattern. Keep in mind this chart is expressly made for a gauge of 6.5 x 8 stitches per inch. Make sure you are knitting at that gauge or your pattern will not look the same. 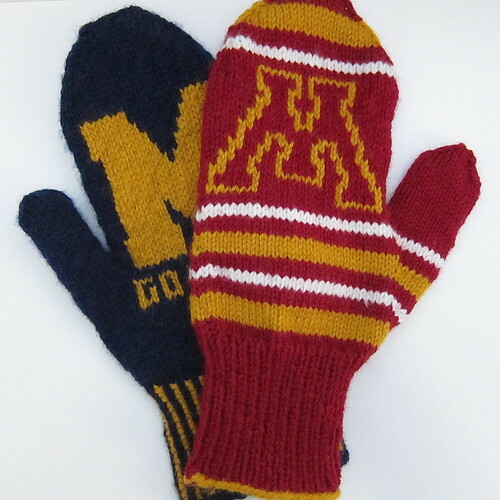 Of course, you can also download my charts for the Michigan or Minnesota logo mittens. Second, let’s talk about stripes. 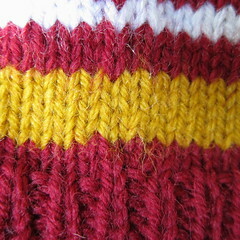 On the Michigan mittens, I did a vertically striped ribbed cuff. This effect is easy to achieve in the following manner. Row 2: Blue *k1, sl1 purlwise Repeat from * until end of round. Row 3: Maize *With yarn in back sl1 purlwise, p1, move yarn to back. Repeat from * until the end of round. Repeat Rows 2 and 3 for desired length. Basically, you are knitting one row with the blue while slipping the purls and then purling the next row with the maize while slipping the knits. This type of ribbing does not pull in as much as regular knitting, so you may want to go down a needle size when doing it for a tighter cuff. On the Minnesota mittens I did horizontal stripes, but the mittens are knit in the round and I didn’t want that step you get when changing colors in the round. There is an easy way to get around that. When you are changing colors, knit one round of the new color. 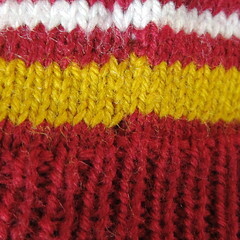 At the beginning of the second round, pull up the stitch from the row before (old color) and put it on the needle. Now knit that old color stitch with the first new color stitch. Now, you’ll have beautiful, stepless stripes. This pattern makes women’s size 8 mittens. I have a pattern for a larger men’s size with another Michigan chart here. 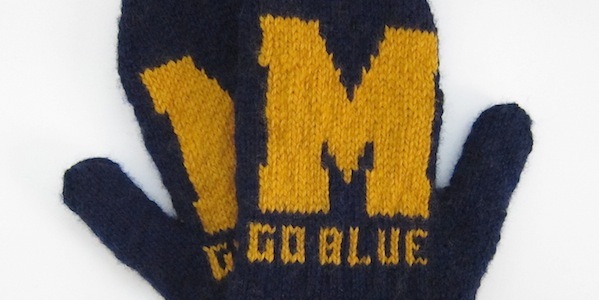 Download a pdf of the Go Team Mittens pattern. Update 1/8/13: A few people have written me lately asking if I did the colorwork as I went along or if it was duplicate stitch. I did it as I went along. I carried the yarn, twisting it every 3 stitches so there weren’t long floats. I like the fact it gave me a warm, thick mitten. You coud easily do this as duplicate stitch if you preferred though. Cast on 52 stitches. Divide between 3 needles. Join together to form a circle being careful not to twist the stitches. Place a marker to mark the end of the rounds. Place the first 9 stitches on one needles and the second 9 on another. Join together using the Kitchner stitch. You can finish the top of the thumb either with kitchner stitch or by running the tail through all six stitches and pulling tightly. Those are awesome! I showed my husband because he went to Michigan and is a big fan. how hard would it be for me to make Michigan State Spartan Gloves to sell at an upcoming Craft Fair? I would love to make both MSU and UM Thanks for sharing!! Diana – It really depends on how fast a knitter you are. But there is also a bigger issue. The team logos are trademarked and you can get in trouble for selling items you make with them on it. I love these mitts! I can’t understand how to use the chart with this pattern though. When I make one left does it count as the next stitch in the chart? I sent you an email & hopefully it will help you see how to use the chart and written pattern together. I love this pattern! 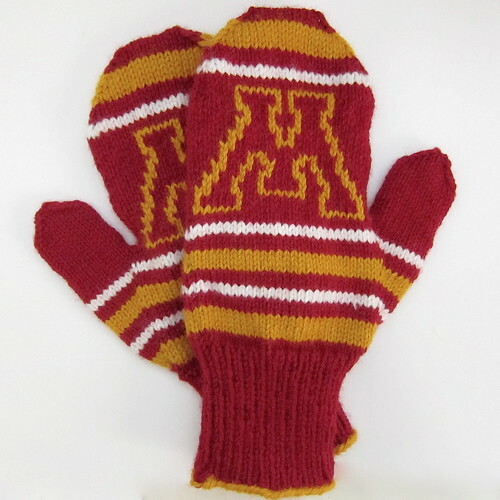 I’m considering making the Minnesota ones for my cousin’s Christmas present. I’ve done colorwork before, but never designed my own pattern. How would you recommend sizing up your pattern/chart so it will fit an average man’s hands? 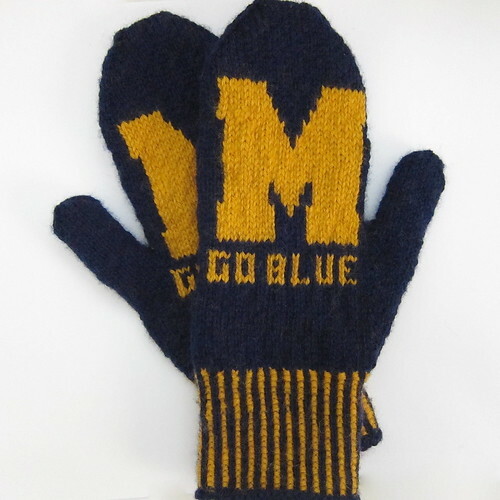 These actually make a pretty big mitten, one that is 8″ around, so they might actually fit a guy. If you think he needs bigger, you could just add a few more stitches around, 3 or 4 stitches for approx 1/2″ or 6 or 7 for an inch. You would probably also want to add a little more length before decreasing for the hand. You could also find a basic plain mitten pattern the size you want in a similar gauge and just add the colorwork.